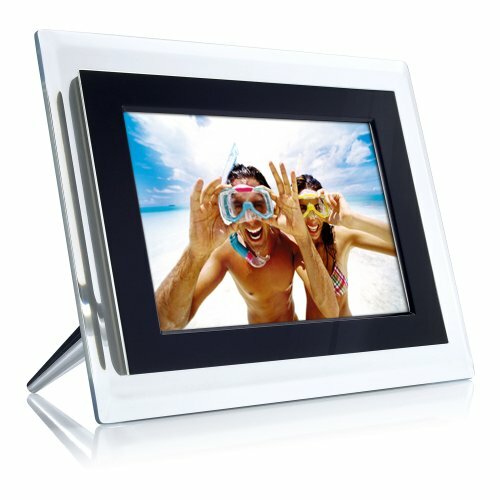 The 7FF2FPA digital photo frame deliers a 6.5-inch, high-resolution image -- up to 720 x 480 pixels. Display your digital photos with the same rich color and quality of professional prints. The high pixel density give you sharp, detailed photo displays in a 4:3 aspect ratio for optimal picture viewing. The Auto Fit feature automatically size a your digtal photo to fill the screen, and Photo Manager will allows you to display slide shows, single photos or thumbnails. Easily create photo albums, cut and size your photos, and rotate or mask to customize the image. Fast and easy photo transfers from you PC via USB 2.0 connection. Memory card slots allow you to transer, copy or use as additional memory for the photo frame. The Philips photo frame also has 16 MB of built-in memory, so your favorite pics are never out of reach. AC power cord included.